Longing for Heaven? Looking forward to the New Earth? For three months now I’ve been listening to this album, and it has become part of my daily life. I’ve bought and given away ten copies of “The Far Country” to friends and family. It’s contemplative, biblically resonant, artistic and contagious. It has the feel of folk music, but it’s much more. The lyrics, even in the more whimsical songs, have real depth. (“We ache for what is lost;” “I was made to go there.”) I liked it the first time I heard it. (Someone who’d read Heaven gave it to me). But the more I’ve listened to it, the more I’ve come to love it. If you decide to buy it, I recommend you do what I didn’t think of doing. 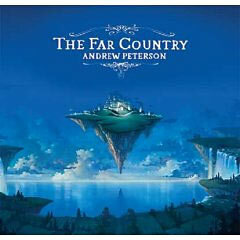 Since Andrew Peterson is an independent, order it from his website store at http://www.andrew-peterson.com/. You’ll get it cheaper. (I could have gotten my ten giveaway copies for $85—I just ordered my second ten this way.) More importantly, you’ll be supporting Andrew and his family. You’ll be casting your vote for Christ-honoring music, and if you’re like me, God will draw you to Himself through this music.